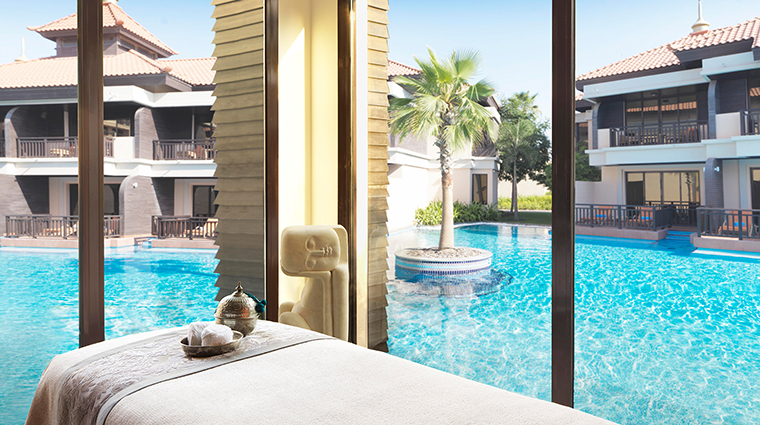 The Asian-inspired Anantara Spa, housed within the tropical Anantara The Palm Resort, stands out from the area’s other ultra-luxurious spas on many counts. The location on the eastern crescent of the beautiful and serene Palm Jumeirah archipelago in Dubai allows you to leave the fast-paced vibe behind, yet it is easily accessible from almost anywhere in the city. The surroundings transport you to a Thai fishing village, complete with birdsongs and tranquil lagoon views, and while the brand’s deliberate focus on wellness and relaxation stems from ancient tradition, the facilities are decidedly contemporary. In the spirit of meeting the needs of its Middle Eastern clientele, Anantara Spa offers not only Asian-themed treatments, but also a wide range of therapies inspired by Arabian heritage and wellness traditions from around the region, in perfect harmony with a striking location by the Arabian Sea. 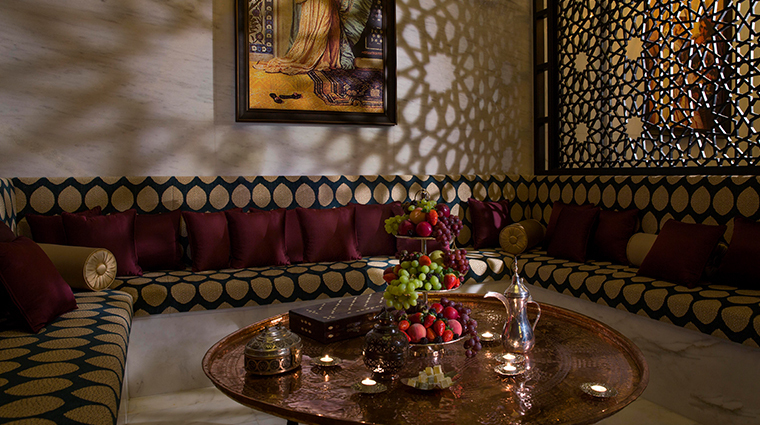 • Anantara Spa is especially appealing to couples looking to celebrate special occasions with indulgent treatments (try the two-hour Dubai Romance) and private spaces like the sensual Royal Hammam. • There are dedicated Ladies and Gents Nights on Wednesdays and Tuesdays, respectively, from 5 to 10 p.m. with exclusive spa access, rejuvenating treatments and use of additional facilities like the ice fountain, crystal stone steam room and herbal bath. 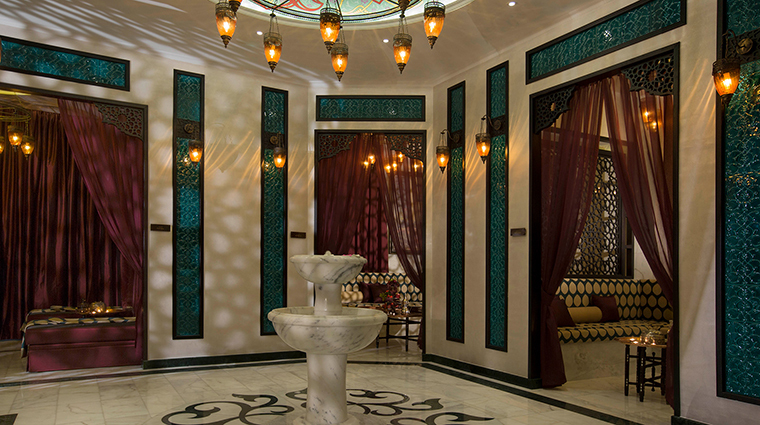 • The exquisite design and décor of the Turkish hammam evokes Old World Arabia to create an experience that feels both authentic and lavish. The marble, latticed windows, rich fabrics and warm colors separate this private space from the Zen-like Asian feel of the rest of the spa. • The men’s and women’s wet facilities feature different offerings to optimize your experience. Gentlemen can take a dip in the liquid sound pool, while ladies will enjoy a stint in the crystal and gemstone steam room. 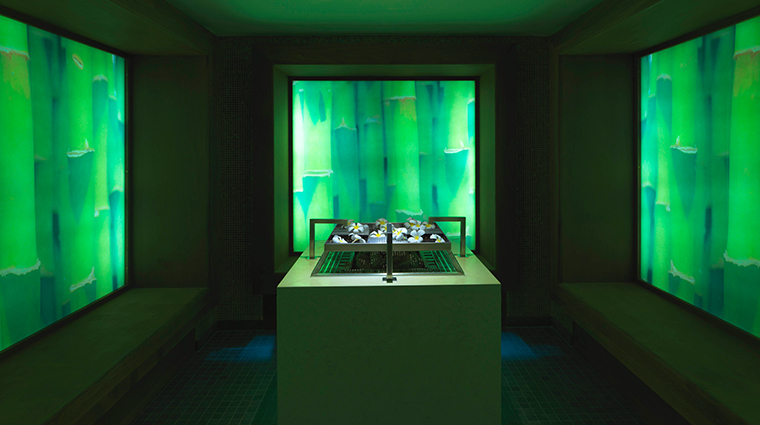 • The spa is surprisingly kid-friendly, offering a specially curated menu of treatments for little ones. 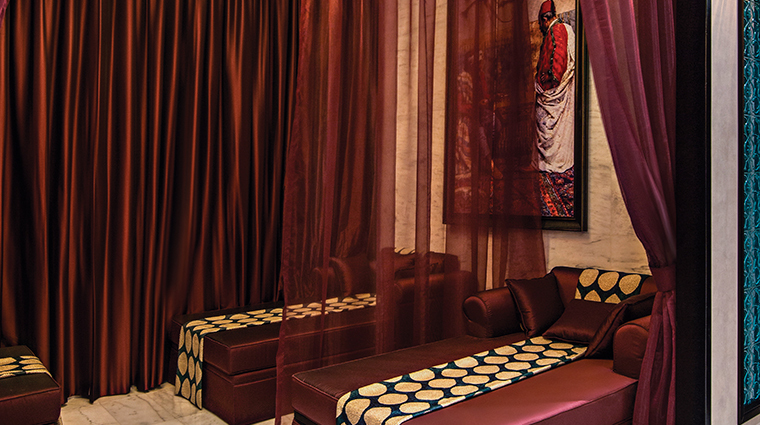 • You can choose to upgrade your spa service with Microsilk technology, first introduced in the region by Anantara Spa. Soak in a bath supersaturated with bubbles designed to improve your metabolism. • Arrive early to get a spa consultation over a cup of tea in the relaxation lounge and make use of the wet facilities before your treatment. • At the in-house boutique, you can buy the exclusive range of Anantara Spa products, including the all-natural collection crafted from internationally sourced floral and fruit blends, oils and spices. • For a holistic experience, try the Nham Jai spa journey, a Thai treatment using native techniques and ingredients, and consisting of a flower foot ritual, a body exfoliation and mask and a signature massage. 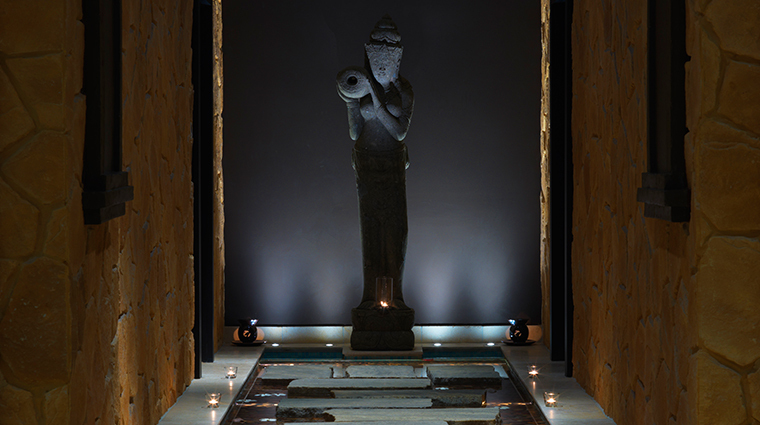 • To rejuvenate the body, opt for the Anantara Signature Massage, which relaxes the muscles and stimulates circulation. 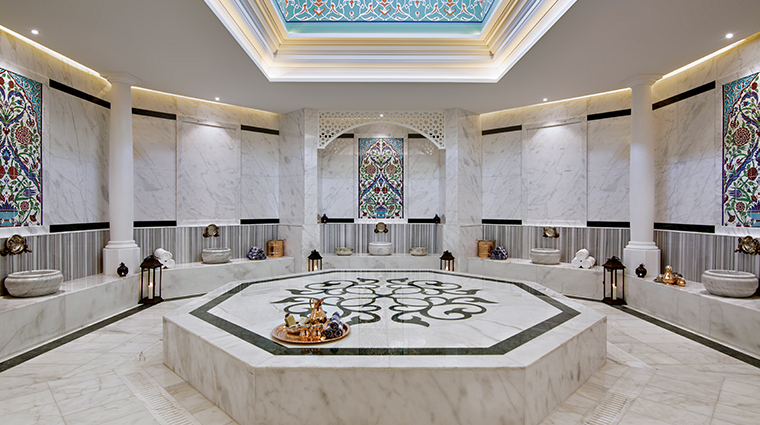 • For a spa experience unique to the region, try the Traditional Turkish Bath Ritual in the gorgeous hammam that begins with a thorough scrub on a warm marble slab followed by a foam bath and massage. • The Dubai spa employs products by internationally acclaimed brands, like Natura Bissé, Elemis and Charme D’Orient, for an extra touch of luxury. • There are separate facilities and changing rooms for men and women, a couples’ hammam, relaxation lounges that offer plenty of privacy, and a boutique stocked with aromatic oils, salts and other spa products. • The five couples’ suites are spacious and come with a built-in sauna, shower and infinity pool bath or whirlpool. • In addition to the treatments, there is an extensive range of additional wet facilities, separate for men and women. These include steam and sauna rooms, experience showers and salt inhalation rooms.